Last week we launched a book tour for B. Lynn Goodwin’s memoir, Never Too Late: From Wannabe to Wife at 62. Lynn is a longtime friend of WOW, owner of Writer Advice, and a manuscript coach. So when I found out her book—which is gorgeous, by the way—was published by Köehler Books, I was intrigued and wanted to learn all about them. Lynn introduced us to president and owner John Koehler, and I asked him for an interview, which you’ll read below. We asked some tough questions (including how many books they traditionally publish, how many pages they read, and even if self-publishing with a publisher was actually vanity publishing! )—some questions were from me and some from our audience of writers—and I found his answers to be candid, pragmatic, and highly informative. WOW: John, thank you for taking the time to chat with us today. 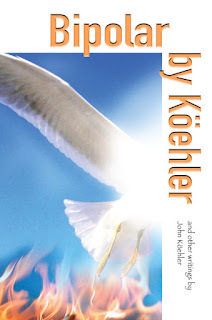 I’m always interested in business “creation stories.” What inspired you to create Köehler Books Publishing? John: Essentially it was based on my own personal needs. I had written my first (of seven) book, Bipolar by Koehler, back in 2004 and needed to get it published. Talked to some agents but they were on a different planet and I wasn’t looking for permission. I didn’t need their permission. I was demanding the right to be heard! So I decided to do it myself. It was a God thing for me, and I was bound and determined to publish the book so that I could help people who also suffered from bipolar syndrome. I owned a graphic design studio, so I already had editors, and I designed it myself. I studied book interior designs and the mechanics of cover design. I had to sort out the distribution and printing and ebook. Eventually I found Ingram, and all was well in my world. WOW: What an inspirational story! I relate to the need to tell your story your way, and to have creative control. I’m sure your authors are happy you chose this direction! 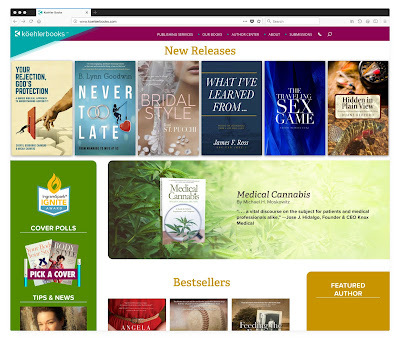 You offer three publishing packages, including traditional publishing. How many traditional publishing deals get awarded per year? What are some of the key elements you are looking for? John: We publish about 75 books a year, and of those I’d say we do about 10-12 traditional deals. I don’t really care for Traditional publishing as a publishing model. It is a bad business model. I call it faith-based publishing because we are hoping and praying for returns. But we NEED to be in it because typically it means the best top-shelf work, and it keeps us legit in the literary world. It helps us to not be labeled a “vanity press,” and keeps us connected to agents, reviewers, awards programs and more. I like all that, I just don’t like the model. We get a TON of new authors who demand to know why they don’t qualify for a traditional deal. When we share that list with them they become quiet. We don’t share it to be mean, but to show them how important it is for them to not just have a great piece of work, but to be a hugely collaborative team player who has a rocking hot social media campaign with followers galore. WOW: In your list above, you mentioned a story that is superbly crafted and edited. How favorably do you view submissions that have been previously content-edited by a professional? There’s a strong argument for an author to do so, but are your staff editors ever put off when they disagree with a previous editor? John: We love it when an author has taken the time and initiative to get their work polished and helped by a professional editor. The key word is “professional.” A good developmental edit can make the overall story much better, and a good copyedit can improve the craft grammatically and stylistically. That can ultimately mean not just a better story, but lower editing costs on our side. There are occasions when a crappy editor does no good, but most editors will improve the work to some degree or another. Any improvements are welcome as long as they do not change the voice and intent of the author. WOW: In terms of what you’re looking for, there seems to be a schism between what publishers seek from “new authors,” and what actually gets sold on bookshelves. Most of the contests and open submissions for short fiction seem to favor literary pieces that prioritize experimentation over structured narrative; however, similar fiction rarely makes the bestseller lists. What are your views? John: The Academy of Motion Pictures sometimes picks movies no one sees. The same is true in the literary world. Reviewers and hobnobbers can be snobbish about what they decide is good. In general most or them have good tastes, but they also have a tendency to put down more commercial and successful work that does not fit their worldview. This kind of hypnotic hyper-critical focus is detrimental to art in general, and literature in particular. Reviewers and the Literati do not decide which books will succeed. The readers do. Individually they can’t hold a candle to big shot book people, but collectively they are absolutely brilliant and leave them all in the dust. We have a diverse mix of genres, as you can clearly see here. Which means that with very few exceptions, we are not actively seeking out a particular genre. That is about to change very soon as we develop our Leadership imprint. Stay tuned. WOW: That’s good to know! Do you have a list of preferred agents who contact you, or do you give equal consideration to any agency query? Do you have any advice for authors trying to evaluate which agent is most likely to get a publisher’s attention? John: We have a lot of respect for agents, and we feel lucky to have worked with many. The vast majority are highly intelligent and have honed a superb nose for fine work. They can smell quality quickly. They can weed through hundreds of manuscripts and find the gold. We know when a legitimate (some are not) agent submits a manuscript, that we can expect a much higher level of work than the average writer. We like that. Most agents are traditional only, but more lately are open to considering a hybrid deal, in some cases recommending that to their client if they cannot sell the manuscript. They come to us as an incubator to prepare the author for jumping into a traditional deal in their next work. That is the goal for all of our copub authors, but it ain’t easy to get there. Perhaps 10% make the jump based on book sales. For us 3000 is the magic number. WOW: Thank you for that number—it’s a great reference! Speaking of numbers, how many words or pages do you typically give a submission, before deciding to set it aside? John: I know agents who will not even read a manuscript if the query letter contains an error. Our submissions editors probably read on average of 20-30 pages, and then drop in to the rest of the manuscript to check for consistency, redundancy and style. I read much less for my reviews. Now if we have a piece of work we think is a potential traditional deal, we read much further, and get our exec. Editor Joe Coccaro involved. John: Self-publishing authors get all their royalties, no marketing from us, no coaching. Lower overall production costs. They get the freedom to change their meta data, do a ebook sale whenever they like, and the chance to manage their publishing in exactly the manner they want. ISBNs included. No contract just an invoice. 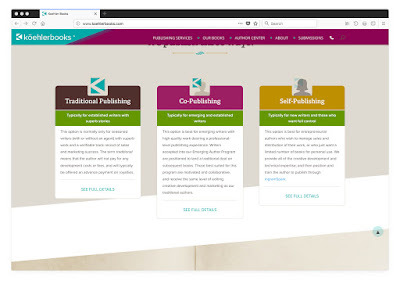 Co-publishing authors pay more, but they get a comprehensive marketing program that includes things like a tip sheet, cover poll, digital ARCs, foreign rights agent, significant coaching and training and management of their book. Royalty is typically at 60%. ISBNs included. It also includes a solid 4-page publishing contract that lays out what we do, what the author does, royalty rates, term, release date, etc. Sample is here. In addition we provide a comprehensive line-item invoice showing precisely what the author is paying for. Sample is here. Self-publishing is growing, and is now about 20% of our work. When we say self-publishing it means that the author is acting as the publisher of record and has an IngramSpark account. They hire us to do the creative development, the design and editing, production and tech stuff and get it all installed on there Spark site. We still advise but since they are the publisher, we propose and they dispose. Co-publishing is by far our most popular publishing model, with about 65% or our deals going that way. The main reasons authors choose that model is because our name is on the book as a legitimate publisher of record, we handle all details so they don’t have to, we are very collaborative, and we love working with emerging authors. In 2016 we wrote and publishing a little book called the POCKET GUIDE TO PUBLISHING: 100 Things Authors Should Know. I offer it as a helpful guide to your writers who are on a journey. WOW: That's super helpful! Thank you for the links to the sample contract and production invoice, and to the guide. As far as self-publishing, what are the advantages of self-publishing with a publisher? It seems like a contradiction. How does the process differ from vanity publishing? John: I can’t speak too much as to how other publishers do it. Our mission is to aim high and act as much as possible like a bigger high-quality traditional publisher. Our standards of excellence are the same for traditional and co-publishing. We relax them more with self-publishing because we do not control the outcome as much. We are simply hired guns. But for traditional and copub, our name is on the book along with the writers, and we are ultimately responsible for the output. Therefore we take it very seriously. Vanity publishing is such a silly term. Last I checked every author alive has a certain amount of vanity and self-interest. Over the past ten years all of the major NYC publishers have launched some kind of self-publishing fee-based division. Penguin, Simon & Schuster, etc. The reason they did is because they actually want to make money off of authors, and serve them in the best way. Publishing is a FOR-PROFIT business. There is nothing wrong with a publishing company getting paid by the customer for creative development and/or as part of net sales royalties downstream. Back in the day only a select few authors could get published. Only the best could get an agent. And only the best agented authors were selected by publishers. But now anyone can get published, and there are publishers who will in fact take anyone, regardless or the quality of the work and what kind of person the author is, or their marketing program. We like to say that everyone has the right to write, and I truly believe that. That is true of every art form, whether music, visual arts, dance, sculpture or writing. We have a right to express ourselves. But (and here’s the big rub), if the artist decides to share her art with the world, then she is called to do her absolute best to perfect and polish her craft using the highest levels of literature and publishing. That is the problem: many writers do not try to create their best work, they simply want to make a mark as quickly as possible. And that does no one any favors. That is why self-publishing still has a second-class meaning for fine art writers and reviewers. Interview by Angela Mackintosh, publisher of WOW! Women On Writing. She's interested in both traditional publishing and self-publishing, depending on the project. John--Thanks for untangling the different options that exist for writers. I especially appreciated the line, "We still advise but since they are the publisher, we propose and they dispose." What an awesome and informative interview. It makes me realize how little I know about the publishing industry and process. Completely agree with these comments. WOW! What an amazing interview. It's like taking a workshop or class. I had to read this interview twice - it's packed full of information! I agree with Margo - it's like taking a workshop!!!! Even though I've been doing this writing thing for decades, and technically I'm a Koehler "insider", I found the interview highly informative (and fun). Thanks, WOW and John! Thanks for sharing all of this information, John, and thanks for interviewing him, WOW! I like knowing I'm doing business with a strong company that has vision.